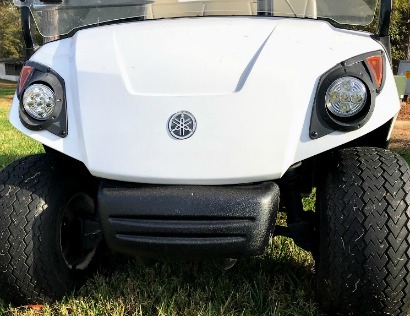 Yamaha golf cart accessories customize and personalize your golf cart or they can just make your cart more usable comfortable and functional. A rounded design made of high gloss black powder coated finish protect your front cowel as well as the headlights. 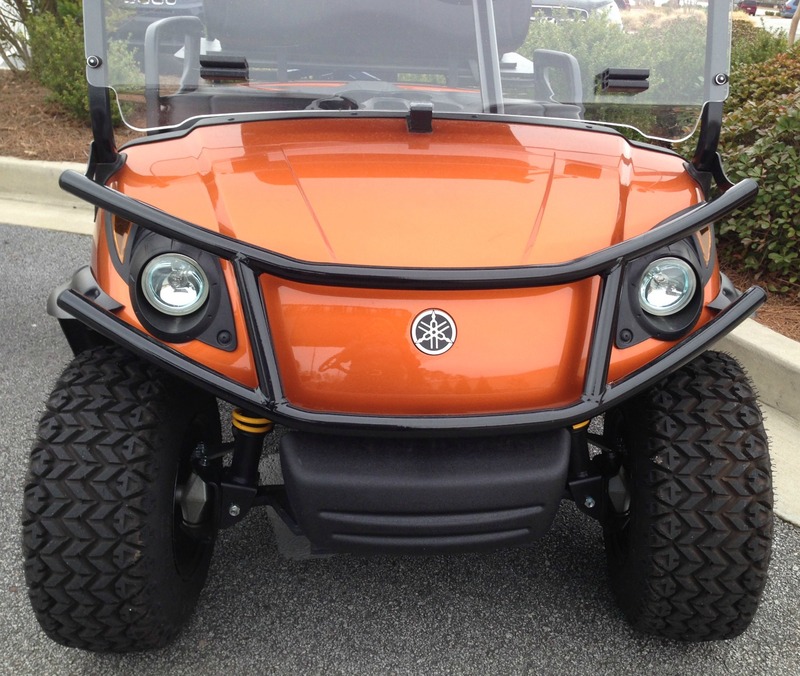 Brush guards offer a rugged custom look to any golf cart. This accessory comes in black, gun metal and a shiny stainless. 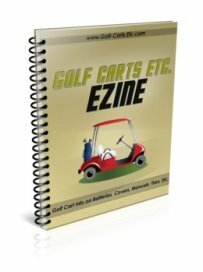 You will need to know the make, model and year of your cart to purchase the one that fits your cart. 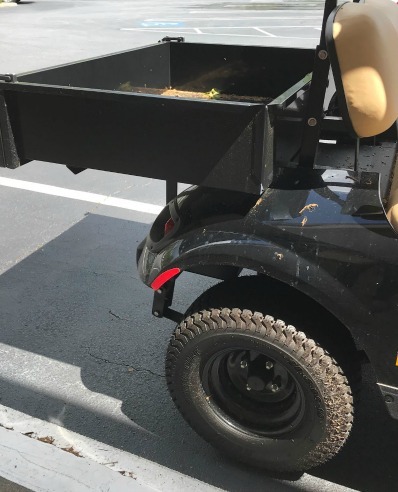 Give your cart a sporty look with fender flares and keep mud and debris away from you and your passengers. Fender flares are typically 3" wide and come as a set of 4 - 2 for over the front tires and 2 for the back. Be sure and order the ones that are specific to your golf cart make and model. Add, replace or upgrade your Yamaha golf cart headlights or rear lights with a light kit. Kits often include front and tail lights, wiring harness, mounting rivets and templates for cutting the holes into the body. Some light kits are only for carts that do not have existing lights as the cutout may be smaller than factory installed lights. Electric carts need voltage reducers or there may be damage to the lights from excessive voltage. You can choose between LED lights or halogen lights. 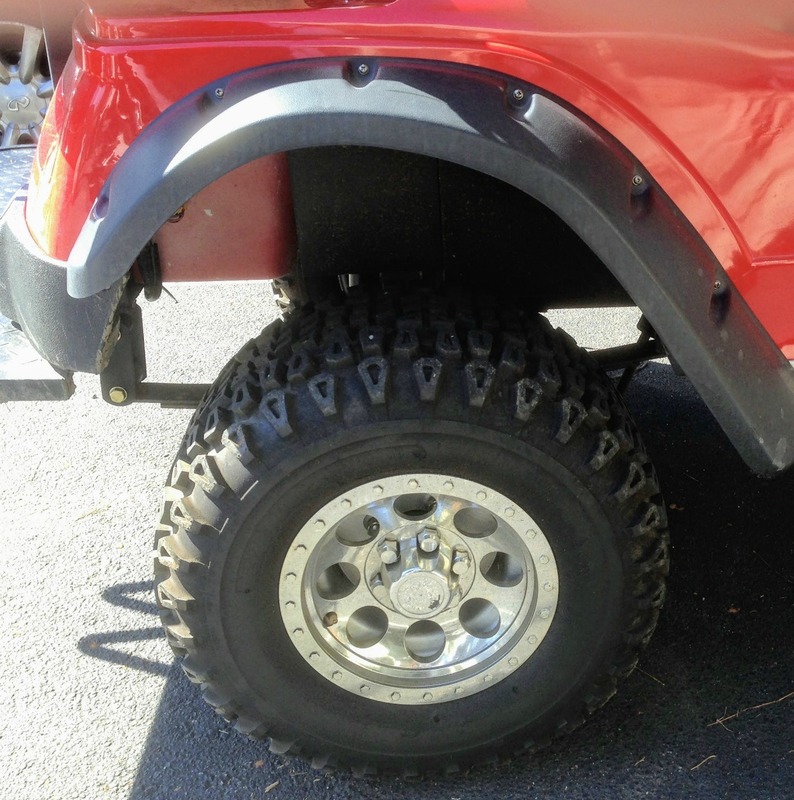 A golf cart lift kit means you can use much larger custom golf cart tires and wheels for a truly custom look. Lift kits are specific to your golf cart make, model and year. 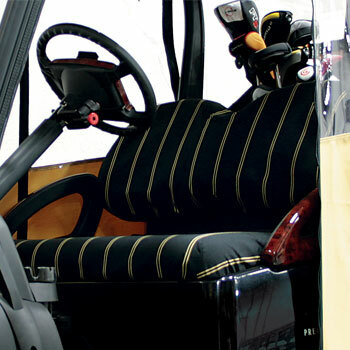 Yamaha golf cart accessories like seat covers can customize your cart. Go from a solid vinyl to a two-tone design. Golf cart seat covers by Madjax are made in the U.S.A from marine grade vinyl. Seat covers are specific to Yamaha models and are designed to fit over your existing seat cover. Golf cart coolers are great to have especially when you play 36 holes of golf on a 95 degree day in the middle of June in Georgia. I am not sure, but maybe if I had had one then, I wouldn't have experienced heat exhaustion. Of course the key to keeping hydrated is to keep water and not Coke or beer in the cooler. There are several sizes and styles available. Decide if you want a cooler that holds a 6 pack or a 12 pack. 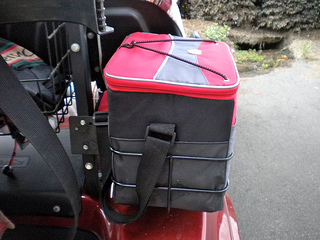 Some coolers have brackets that are permanently mounted on the golf cart fender, while other coolers are made of an insulated vinyl and fit nicely in the rear sweater basket. A lockable glove box is a great Yamaha golf cart accessory to lock up your wallet, cell phone, i-Pod or anything else of value that you don't want sitting in the cart. 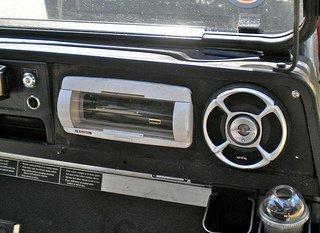 Another option is to chose a golf cart dash with speaker cutouts. Available in woodgrain, titanium or black carbon fiber, this Yamaha golf cart accessory is specific to certain golf cart models. What's better than cruising in your golf cart down a nice shaded path listening to your favorite music? 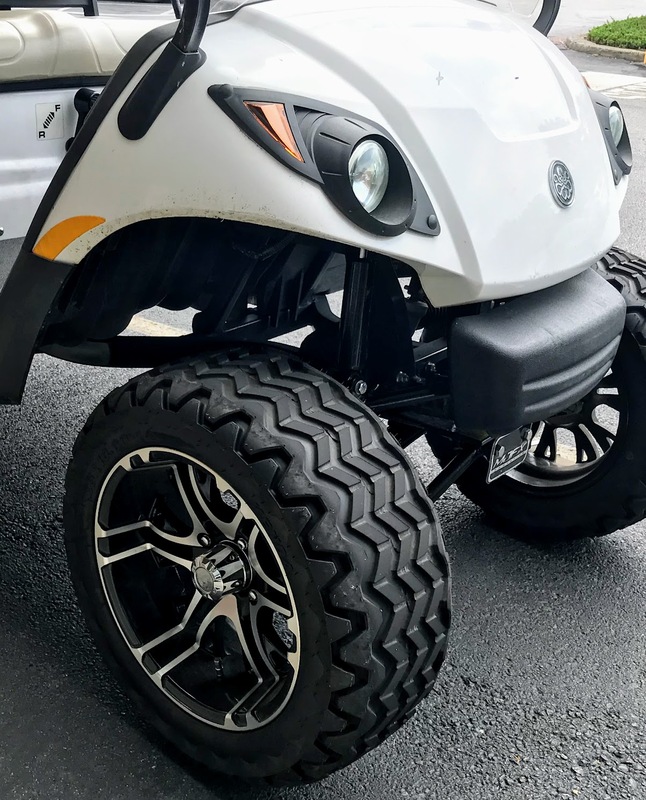 Well, you can with this Yamaha golf cart accessory. The two styles that are available are an over head radio or a console golf cart radio. However, before one can add any accessory that uses battery power a voltage reducer is needed. While some Yamaha golf cart accessories are for fun or for show, other accessories are necessary for safety. 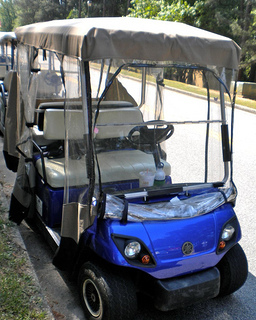 Just like a golf cart enclosure, a golf cart mirror is an accessory that serves a purpose and a function. 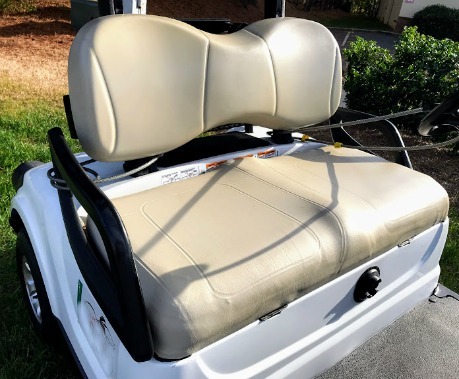 For those of us who live in a golf cart community and drive our carts on all purpose paths, a mirror is just as important as the one in your car. Awareness of what's around you, whether it's another golf cart, a biker or a runner, provides safety to you and to everyone else who is using the path. 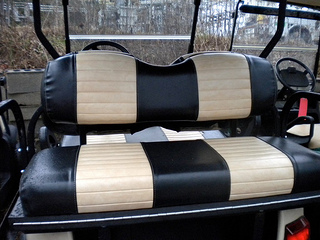 A Yamaha golf cart seat cover can be made of fleece, Sunbrella fabric, or vinyl. A ready made seat cover with elastic like this one fits over the existing seats. It doesn't fit as snug as replacement vinyl covers - which by the way are placed right over the old vinyl seat covers. Some seat covers are universal, while others are specific to the make, model and year of the golf cart. Decide what type of fabric you want and what look and feel you are after. Many golf cart owners around Peachtree City customize their vinyl seat covers to reflect the colors of their favorite football team. t keeps you dry on rainy days and warm on cold, windy days. The golf cart enclosure in the picture also includes a front windshield. As you can see it is rolled down and not being used. If you golf cart has a windshield, buy an enclosure that doesn't include this front piece as it isn't necessary - get a 3 sided - not 4 sided cover. Simply roll up the sides when not in use. You don't need to take it off and store it in the summer unless you want to. Sunbrella fabric is the best fabric for a golf cart enclosure if you plan to keep it on year round like we do. The colors don't fade and it is stain and mildew resistant. Need to replace your Yamaha golf cart windshield? Yamaha offers a one piece windshield or a folding windshield. 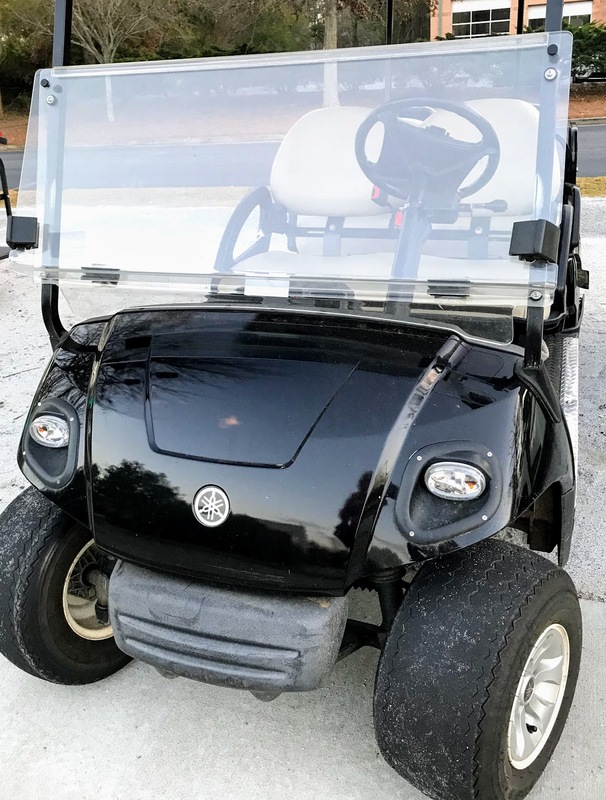 Street legal golf carts require a windshield with a windshield wiper. You will need to know the model and the year of your golf cart in order to purchase the correct windshield. More prone to scratching, but less likely to break or crack. If you use your golf cart for golfing, the polycarbonate is recommended. Turn your 2 seat golf cart into a 4 seat golf cart by addind a Yamaha golf cart rear seat kit. There are two different styles - one is a fixed rear seat and the other is a flip seat. The flip seat costs about $50 more but is a nice feature to have to carry large loads, move stuff or to do yard work. 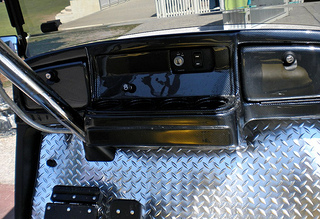 The golf cart rear seat kit is specific to certain Yamaha makes or models. Match the back seat color with the color of your front seats - the seat colors include white, ivory, black and sandstone. 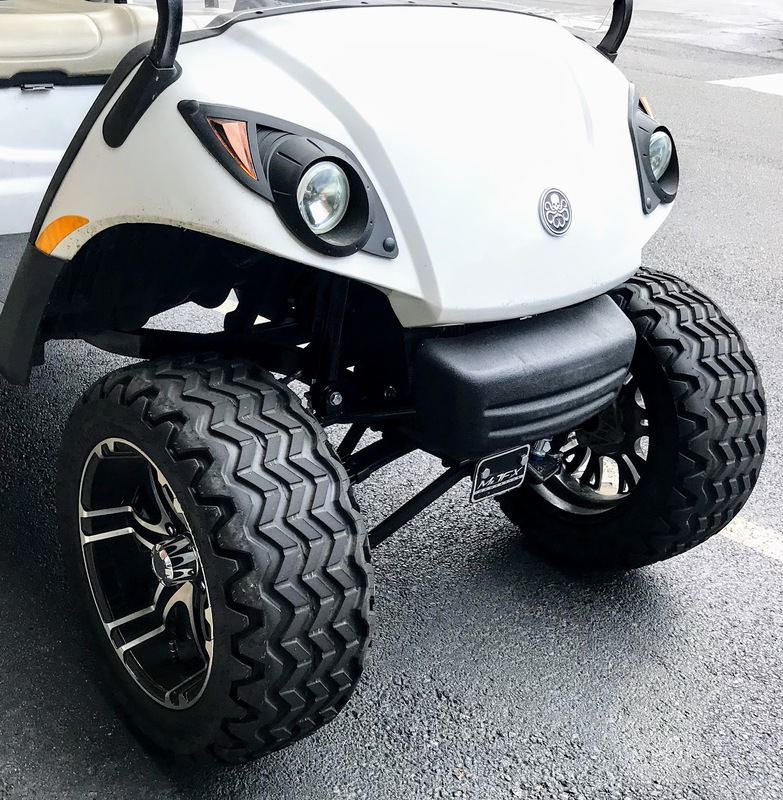 Also pay attention to the color of the struts so that they match the rest of your golf cart - the most common color is black. Another accessory to add is a safety grab bar - it gives something to grab onto for the rear seating passengers when going over bumpy terrain or paths. Some kits include heavy-duty rear shocks, but if not be sure to get some. Customize and personalize your cart with Yamaha golf cart accessories to add style or comfort.